Michael Burgess will be with Sussex until at least the end of the 2018 season. Wicketkeeper-batsman, Michael Burgess has signed his first contract with Sussex. The one-year deal will keep Burgess at The1st Central County Ground until at least the end of the 2018 season. After leaving Leicestershire last year, the 23-year-old was given an opportunity for Sussex in the pre-season match against Cardiff University in April and impressed with scores of 46 and 61. This led to a run in the first-team in the first half of the season when first-choice ‘keeper Ben Brown was rendered unavailable by a fractured finger. In May and June, Burgess made three appearances in the One Day Cup and played in the limited-overs fixture against the South Africans before taking the gloves for four Specsavers County Championship fixtures. He scored 222 runs at an average of 44.4 in his six innings in those Championship games, including two half-centuries. A top-score of 76 came during Sussex’s innings victory over Durham at the end of May. Burgess kept tidily in his nine completed matches for Sussex this season, claiming 22 dismissals from behind the stumps. He also formed part of the Sussex 2ndXI that won the Second Eleven T20 title earlier this summer. Burgess is making his fifth Championship appearance for the club in the match against Durham currently underway at Emirates Riverside. Born in Epsom, Burgess made his way through the Surrey youth system, before playing for Loughborough University during his time as a Sports and Exercise Science student. He joined Leicestershire in 2015 where he remained for two seasons, making a top-score of 98 in a three-day match against Sri Lanka last summer. Reacting to the signing of his contract, Burgess said: “I’m delighted. It’s been a really busy summer. I’ve spent a lot of time playing in the seconds and I was really happy to get my chance in the first team. 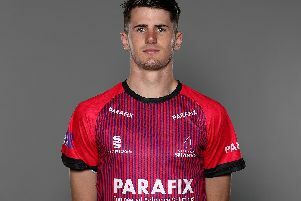 Keith Greenfield, Sussex Director of Cricket, said: “Michael took his opportunities at the start of year impressively and showed that he could perform very well in both red and white ball cricket.